This sky map shows how to spot the moon, Mars, Saturn and the bright star Regulus in the southwestern night sky between May 19 and May 22 in 2010. Full Story. The moon will take center stage in a cosmic dance withMars, Saturn and the bright star Regulus this week during a four-night skyengagement that begins May 19. The celestial sky show will appear in the southwesternnight sky (weather permitting) beginning around nightfall, according to theastronomy magazine StarDate. 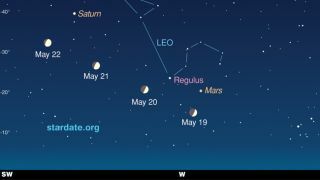 This sky map shows where to look this week to spot the moon,Regulus, Saturn and Mars. On Wednesday, May 19, Marswill appear above the moon while the bright star Regulus shines to the left andabove Mars. The red planet will actually look like a bright orange star,StarDate reported in a skywatching alert. Regulus is the brightest star in the constellation Leo(The Lion) and is more massive, hotter and brighter than our sun, StarDatereported. Together, the moon, Mars and Regulus will form a skinnytriangle in the night sky until about 2 a.m. local time, when they sink belowthe horizon. Saturnwill make its first appearance with the others on Friday, May 21 and shouldstand out in the due south direction of the sky. If you need help spotting Saturn or Mars Friday night,try to use the moon as your anchor. The moon will appear between Saturn ? whichshould look like a golden star ? in the south and Mars in the southwest. The moon and Saturn will take one last cosmic tango onSaturday, May 22 when the moon shines below the ringed planet at sunset. Youcan find them by looking high in the southern sky. StarDate is a bi-monthly astronomy and skywatching publicationof the McDonald Observatory at the University of Texas at Austin. Skywatchers can also find the brightstar Arcturus in the constellation Bo?tes (The Herdsman) this week. To find it, look at the Big Dipper. Imagine extending acurve of its bent handle about the length of the Big Dipper itself and you willultimately come to Arcturus. Arcturus ranks as the fourth brightest star in the nightsky overall, behind Sirius, Canopus and Alpha Centauri.